13-Feb-2013 -- For the final confluence visit during my vacation in Victoria, I chose what is probably the easiest confluence point in the entire state. 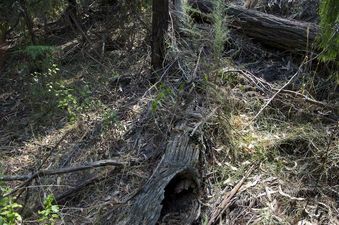 This confluence point lies on the bush-covered embankment of a paved country road (Fraser Spur Road), north of Warragul. The point lies just 10 metres from the side of the road.